Hester once existed only in the pages of a Nathaniel Hawthorne novel. But know a very different kind of heroine answers to the name. In our age of Harper, could this choice rise again? Our Baby Name of the Day is inspired by Mortal Engines. Few names claim a single, dominant form across all of history. Elizabeth mixes with Isabella. It’s nearly impossible to untangle all the various forms of John. We all recognize Esther as an Old Testament name. It may come from the Persian word for star – sitareh. Or possibly it refers to the goddess Ishtar. And some theories make it a botanical name meaning myrtle. Meaning aside, Queen Esther is considered the protector of the Jews of Persia from way back BC. The story goes like this: a king puts aside his wife. He decides to choose a new one through an open call, a beauty pageant of sorts. Esther wins ’cause she’s drop-dead gorgeous. Except she’s also Jewish, and there’s a kerfuffle between her community of birth and her new husband. All of the Jews are ordered put to death; Esther intervenes, using her wiles to convince her husband to spare her people. All ends happily – for Esther and friends, at least – and the victory is commemorated as Purim every year. It’s remained in use ever since, enjoying bursts of popularity, inspiring operas and the like. The most recent Esther boomlet in the US followed the birth of Esther Cleveland, former First Daughter. That’s more than a century in the past. The H spelling seems to come from Biblical Latin, and then filtered into English. Nathaniel Hawthorne chose the name for his main character in The Scarlet Letter. He wrote it in 1850, but set it two hundred years earlier. There’s guilt, there’s shame, there’s a scarlet letter A. While Hester Prynne stands accused of adultery, she’s not the villain. Instead, she carries herself with quiet dignity, and clearly loves her daughter. Hawthorne’s novel remains widely read, so when many of us hear the name, Miss Prynne comes to mind immediately. For years, Esther ranked in the Top 100, with Hester 200 spaces or so behind. The names dropped together, too. But while Esther has never left the US Top 1000, Hester departed after 1950. The name hasn’t been heard from since. Seventeenth century British dancer Hester Santlow, sometimes called England’s first ballerina. It’s the given name of Lady Stanhope, a socialite turned adventurer. In 1815, she used a medieval Italian manuscript to launch a trailblazing archeological expedition in Israel. Hester Lynch Thrale, an eighteenth century diarist. George Eliot’s first novel, Adam Bede, was published in 1859. It’s the name of the main characters, though she’s called Hetty. Oscar Wilde gave the name to a character in A Woman of No Importance in 1893. She’s an orphan and an heiress, and a voice for equality among men and women – at least, within the constraints of their era. Just one more: Anne of Green Gables fans might think of Hester Gray’s garden, though Mrs. Gray has died some years before Anne discovers the place. None of these older uses necessarily make the name feel more accessible today. But lately, it’s started to surface in other contexts. It tends to read English, and maybe a little bit posh. It’s the name of the author of The Little Lady Agency novels. We learn that it’s the name of Frasier Crane’s mother on long-running television series Cheers and Frasier. But it’s the edgier uses, the science fiction and fantasy ones that tip the name in a different direction. In The Golden Compass, it’s the name of a rabbit daemon. Libba Bray gave the name to a teacher in her Gemma Doyle trilogy. And then there’s Fox’s comedy-horror series Scream Queens, which gave us a character by the name. Played by Lea Michele, this Hester turns out to be downright dangerous. All of this brings us to 2018. Mortal Engines, directed by Peter Jackson, is based on a 2001 Philip Reeve novel. 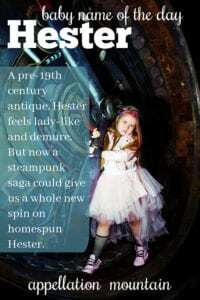 It’s a steampunk adventure, set in post-apocalyptic London, with a heroic Hester at the center of the tale. Four books make up the Mortal Engines quartet. They’ve yet to move the needle on the name’s use. 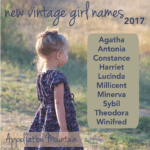 Fewer than five girls were named Hester in 2017 – or in most years of the twenty-first century. And yet, this is the age of Harper and Hazel. And heroine names do sometimes catch on – think of Harry Potter’s Luna. Nickname Hetty makes it particularly appealing, too. 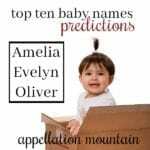 While this name won’t be topping the charts any time soon, that might make the perfect choice for parents after a name in the key of Abigail, but far less common. What do you think of Hester? Is this just hopelessly outdated? Or an intriguing rarity? First published on November 27, 2008, this post was revised substantially and re-published on November 29, 2018. I’m having a baby this month and plan to name her Hester…I love the name and her namesakes, but I am a bit nervous about people’s reactions to it! 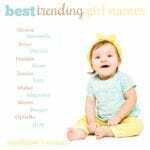 Thank you for this article, it gives me courage to give my daughter this name! Wasn’t “Hester the Molester” the narrator’s cousin in A Prayer for Owen Meany? And I watched an episode of Star Trek: The Next Generation last night with a male scientist named Hester – The Child, Season 2 Episode 1. When I read the Anne of Green Gables books for the first time, several years ago, I remember thinking Hester Gray was such a sweet, whimsical name. Hester is definitely an intriguing rarity. For some reason I really dislike Esther though? Hester is a great strong name whilst Esther seems *weaker* perhaps? Esther I can kind of dig. But Hester’s too far out these. It looks too close to “pester”. Even though the sound so similar, Esther looks and sounds softer somehow. I was wondering if you were going to go Puritan today 🙂 While I would never choose Hester for my own daughter, I think it’s a perfect choice for NotD on Thanksgiving. I liked the Hester Prynne character (what WAS her daughter’s name – I forget). 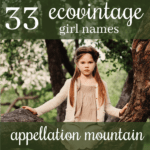 One of my grandfather’s sisters was named this… I didn’t know her though, she died young. But the sound of the name…. just don’t like it at all. Not an Esther fan either but I guess I’d pick it over Hester. No good nn come to mind either , Hess is a gas station and Hessy doesn’t sound good either. Hester’s been a favorite since I was a teen. Esther’s a bit too “polyester” for me, but Hester’s lovely! I agree, Hester Prynne really wasn’t a bad person, she just slipped a little. And what a great name she gave her daughter, eh? 😉 My only problem with Hester is that she’s almost soley associated with “The Scarlet Letter”. it’s one of my favorite stories but still.. I’d hate to be singly associated with anything, even a classic novel. I think that’s what’s keeping her down. You’d be surprised how many don’t know much of anything about Hester Prynne besides that scarlet ‘A’, her manner completely escaped my Junior year English class. My teacher once pulled me aside to say “thank you” to me, for ‘getting’ the story. I apparently was the only one in all his classes. It’s surprising. […] mentioned that she finds H names most appropriate for Fall.